The northwest wind just starting to increase. Near the centre of the picture, you can see a caravan awning headed for the Chatham Islands. A fortnight ago, November 2014, I spent a couple of days in Kaikoura doing a bit of fishing. 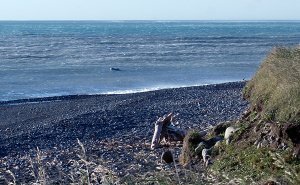 Though I travelled around I spend the nights camped by the sea at Hapuku, near Mangamaunu, about 15km north of Kaikoura. Early Saturday I woke to a warm still morning with the sun rising from the sea to light up the still snow-capped high tops of the Seaward Kaikoura Ranges. Getting on for 7 am I put the billy on for a cup of coffee. It was a glorious day with just a light breeze getting up as I took a few photographs while eating breakfast. There were half a dozen people taking an early morning stroll along the shingle beach when suddenly, out of nowhere, the wind speed began to increase appreciably. 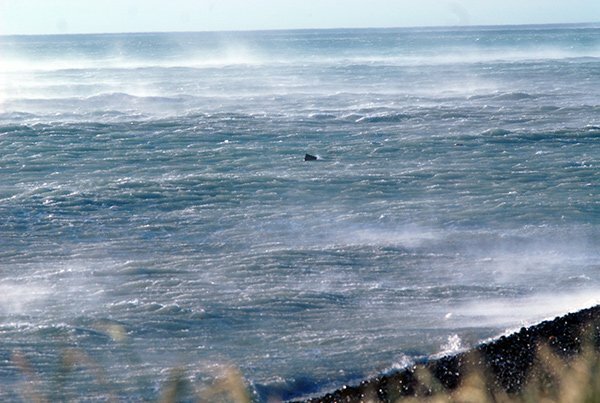 Within the space of just 5 minutes or so the north-westerly had increased to at least 50 knots. I’m not kidding! It was howling. As the people on the beach turned to run back towards their campervans, some hundred metres distant, they could do nothing but watch as their outdoor tables and chairs cartwheeled out to sea. Their furniture was closely followed by anything not securely tied down. Awnings, campervan sky-light covers, clothing, foliage, the lot was all headed seaward! In this picture outdoor furniture can be seen in the tide. With every passing minute, it felt as if the wind speed was doubling in velocity. I jumped back in my campervan and “battened down the hatches.” I could see that the beach walkers had thankfully made it safely back to their campervans. By this stage, my vehicle was rocking wildly in the powerful gusts. I was very close to the sea, parked, like every other silly bugger, out in the open fully exposed to this fearful onslaught of natures fury. “Why the hell did I park in such an exposed position,” I asked myself. 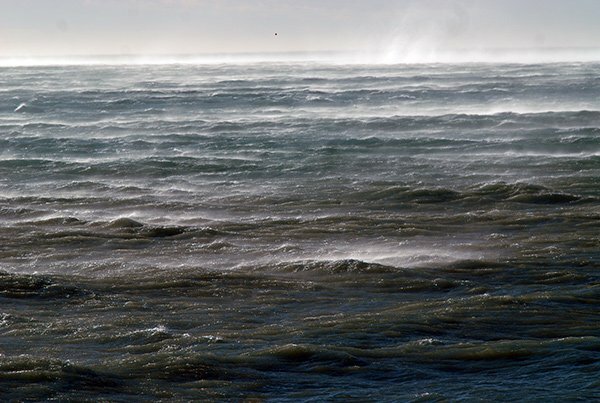 Within a matter of just minutes, the sea has become very rough. Not good if you were offshore in a boat or kayak. You can just make out something carried out to sea by the wind near the top centre of the picture. Keep in mind also that something like ten minutes earlier the sea was blue and calm. Incredibly the wind-speed was still ramping up even more! My campervan was now bouncing on its suspension. Fortunately, I had parked with the rear of the vehicle facing into the wind. “At least I’m not parked side-on,” I thought to myself. An older couple was parked next to me some 20 metres distant. The male occupant climbed from his camper and walked (or was blown) past me and started to look down over the shingle bank towards the beach. I partly opened my window and called out, “what are you doing?” He fought his way into the fearful wind to come over to my window. 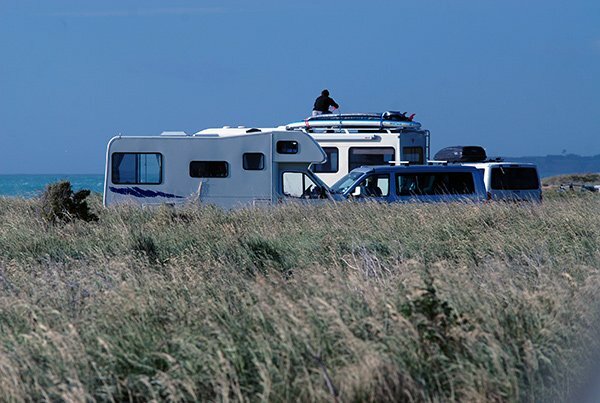 He shouted with a German, or perhaps Austrian accent, that something had blown off the top of his campervan! A sky-light cover I think, he said. “We are leaving now and going to Kaikoura”, he informed me, with obvious fear in his voice. I said to him that it was safer to stay here! With that, he seemed much happier and returned to his own campervan. The wind has dropped enough for this camper to risk added more ropes to hold down his surfboards. 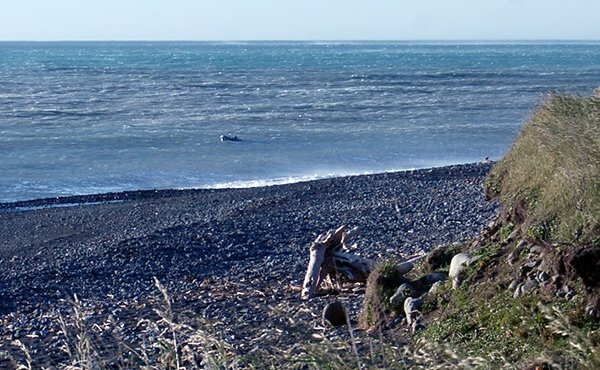 You can see just how exposed to the elements this campsite is at Hapuku, near Mangamaunu, about 15km north of Kaikoura. The howling wind continued at full force for almost an hour before there was any perceptible reduction in its force gauged by the amount my camper was rocking up and down, and from side to side! During this time I must admit my life did flash before me! I vowed that if I made it out of there alive I’d never park in such an exposed position ever again. At one stage I was certain the whole van was going to be blown out to sea! Eventually, the wind did drop and the crisis was over. I started the engine and headed south for Kaikoura. It would have been little more than an hour or so since I had witnessed and photographed, those tables and chairs cartwheeling out to sea. About 5km down the road I came across the scene of an accident with police and the fire service in attendance. A large, full size, campervan was upside-down in a ditch on the side of the road. Obviously a victim of the earlier frightful northwester. I hoped the occupants were wearing their seatbelts and had got out ok. 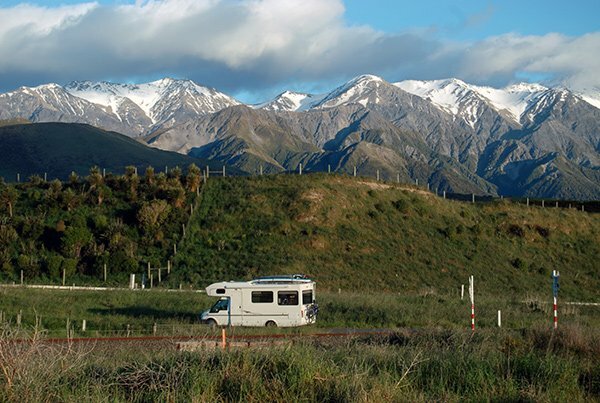 I later learnt over the radio that several campervans had been tipped over along the coast both north and south of Kaikoura Peninsula. Heading south towards Kaikoura from Hapuku after the wind had dropped off. A big campervan similar to this one was blown over onto its roof just a few km further along the road less than an hour before this picture was taken. If the wind suddenly becomes very strong and gusty it is safer to stop your van and point it into the wind and wait for it to drop. You are much more likely to be blown over if you try to keep driving! I felt that I had learnt several valuable lessons from this frightening incident. As mentioned already; I’d think a little harder about where I was parking for the night in future. More importantly, I was thankful I wasn’t out in a boat at the time the wind came up suddenly like that. If I had been in a kayak, or even a quite large vessel, and had been caught out by such a sudden increase in wind velocity it would have spelt certain death. I had listened to the weather forecast on a commercial station the night before. It said the weather for Kaikoura and Marlborough was going to be fine! It would have been more valuable to have listened to the marine forecast earlier that morning. The sudden increase in wind speed that day was scary and very creepy, but taught me a few lessons for the future! 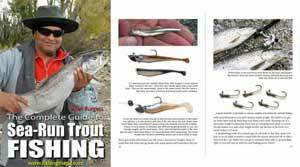 Notwithstanding the weather forecast, if the wind does pick up rapidly when you’re out on the water, if you can get off the water instead of waiting until its too late!